Lean Thinking: Life Lessons - What is a Good Life? Life Lessons - What is a Good Life? Plato, Socrates and Aristotle asked this question 2,500 years ago. Both eastern and western philosophy is largely the search for an answer. A significant conversion -- master of the universe to philosopher. In a recent Business Week interview, Dr. Christensen remarks that he was struck by how badly the lives of his fellow hyper-achievers had turned out. Can Lean principles help to answer this most important question? In my view, Lean thinking is anchored in standards -- images of how things should be. 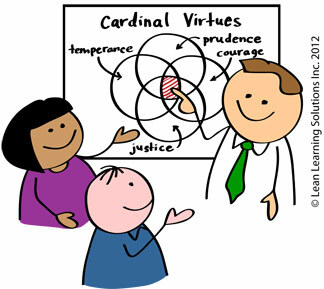 Those of you kind enough to read my books will notice an emphasis on the Cardinal Virtues. In fact, if I had to hazard an answer to the above question, I'd say living a good life entails having good values, and trying to live up to them.